A few months ago, I bought Mark Knopfler's most recent cd Sailing to Philadelphia and showed it to Patrick. 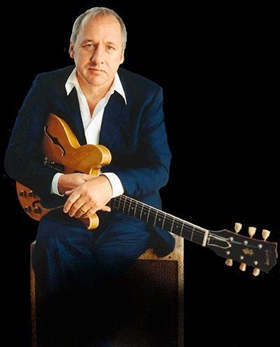 After opening the jewel case and looking at the picture of Knopfler with his receding gray hairline cut short, his black sports coat with an immaculate white shirt open at the collar, sitting on a crate, hunched over a guitar, Patrick said, "That guy has no rock left in him at all." And that was before he learned that Knopfler sang a song with James Taylor on the album. I was irritated and dismissive on Knopfler's behalf. 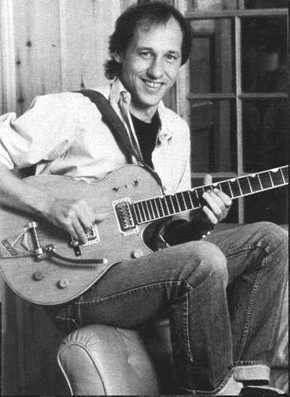 In an age when rock has elder statesmen, and a lot of them are not nearly as embarrassing as had been predicted, I wanted to assert Mark Knopfler's prominence in their guild. He belongs there. 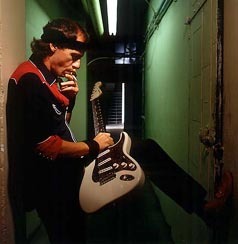 As the singer/songwriter/lead guitarist for the band Dire Straits (the DS song and video "Money for Nothing" hit the airwaves just as MTV was gaining prominence and helped make the album Brothers in Arms an eighties phenomenon) and sideman for the likes of Van Morrison, Bob Dylan, and Tina Turner, his music will be heard on classic rock stations forever. On the other hand, and it kills me to admit this, Patrick has a point. Although Mark Knopfler has impeccable rock ability and credentials, that isn't what made his music unique and isn't what is going to make it last. What will is the sense of space he conveys behind the notes he plays, the way his songs become environments-music that sounds like a cloudy sky, blue and backlit by stars. For instance, on Dire Straits's third and best album, Making Movies (produced by Jimmy Iovine). The first song, "Tunnel of Love," begins with Roger and Hammerstein's "Carousel Waltz" on a wheezey old harmonium with guest pianist Roy Bittan (from the E-Street Band) playing counterpoint below. The sound is soft and distant, as if its source its source-the carnival-is hidden in a glen. Then the organ holds its final note while the piano abandons melody to repeat an escalating three note refrain, gradually louder and faster, then with a grace note at the beginning so when the first guitar chord and drum beat are simultaneously struck the time signature has been changed from 3/ 4 to 2/ 2. The change in music matches the change in scene-it's as if you've crested the hill and the carnival is laid out below with all its light and sound and excitement-then Knopfler's descending guitar notes pull you headlong into it. 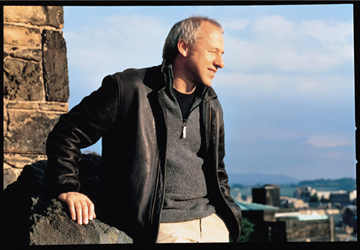 "Tunnel of Love" was the song that got Knopfler his first soundtrack gig, for Scottish director Bill Forsythe's Local Hero. The movie tells the story of a Texas oil employee dispatched to Scotland to buy a costal town with huge oil deposits just off shore, but who falls so hard for the town he almost can't complete his mission. The lure of the town is part of Forsythe's idea of human commonality, and his Celtocentric belief that all hearts lead to Scotland. Forsythe's countryman Knopfler musically echoes the sentiment by clarifying the relationship of American country music with its own Celtic heritage, and by hiring Scottish Gerry Rafferty to sing the "American" pop song ("The Way it Always Starts") he wrote for the movie. The soundtrack foretold future collaborations with country music legends like Chet Atkins and his participation in the Appalachian influenced Notting Hillbillies, but the most wonderful part of the album is the middle third where music follows the movie's hero in and out of a ceilidh, between the cozy indoor playing of folk band The Acetones and Knopfler's adaptations of that music in which you leave the room, hear the ocean and, somehow, the aurora borealis. Local Hero is one of his most beautiful accomplishments. You'd say, "Baby, what's wrong?" Then on "Skateway" from the same album--which will be the theme song of the TV show based upon my life--his voice swells and breaks with vicarious joy. Aureng Zebe is absolutely correct in stating Rollergirl (whose character was appropriated and desecrated in the awful Boogie Nights) is pop music's equivalent to the heroine of Wallace Stevens's "The Idea of Order in Key West," creating "her own world in the city." No rock left at all--But how bad is that? This past weekend, I heard Dire Straits on the radio two times, and both times the song was "Walk of Life." Now I like "Walk of Life," and I'm happy for all those who are getting residuals from it, but believe me, there's so much more to Knopfler than his riff driven hits. Ask anybody who's heard the first shivery guitar notes over a sonorous electronic hum on "Private Investigations" (from Love Over Gold) and suddenly felt as if the air had gotten cooler and strangely calm. Or if you happen to have bought (and kept) Brothers in Arms in the eighties, skip past the hits and spend seven minutes with the spellbinding title track. Just go out and buy Making Movies and listen to the elegance which he imbues ordinary heartache, and the dignity he finds in self-sufficiency. He creates a world and you just have to listen to step into it. So listen.